“Some people boast of selling at the top of the market and buying at the bottom – I don’t believe this can be done.” – Bernard Baruch. 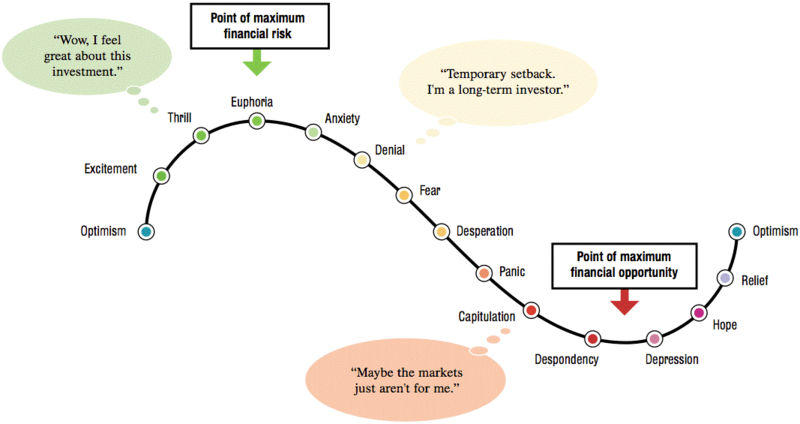 In Part 1, I outlined how it can be emotionally healthy to examine investment account statements through bullish and turbulent market cycles. Consider it a healthy exercise in financial awareness; to generate questions or set a meeting to review a financial partner’s overall money and risk management philosophy. The financial services industry prefers that investors ignore frequent scrutiny of accounts that may generate queries. Although I understand ‘checking in’ too often may motivate emotional investors to make changes haphazardly (which is not a good thing), there’s nothing wrong with curiosity, examination and query (as much as the industry makes you feel stupid for doing it). Brokers either don’t have confidence in their customers or are hesitant to respond to questions as their answers are repeated regurgitations of industry dogma designed to sound like guidance yet are empty words to shuffle investors along to engage a new prospect. After all, those sales quotas are killer. Part 2 – I Think We’ve Seen the Bottom (Top)! Oh, the elusive stock market bottoms and peaks. A Holy Grail of market calls. Wall Street is paved with the hubristic commentary of financial pros who are bold enough to call big turning points in market trends. Pundits are unashamed to bloviate on national financial news as they know they’ll never be called out for being wrong. Unbelievably, there is a legendary Wall Street veteran who I recall was close to calling the 2009 market bottom. His name is Laszlo Birinyi. In December of 2008 his organization produced a report (I still have my original copy), titled S&P 750: The Bottom. There are few market sages I admire and most of them are dead. Mr. Birinyi remains one who is still breathing! I recall studying his report and hoping (perhaps praying), he was correct. The S&P 500 bottomed in March of 2009 at 666. Market forecasting is a seductive sham. As investors we must ignore forecasts and learn to listen and study what the market is attempting to communicate in the present. For example, in our weekly newsletter available here, RIA’s Investment Strategist Lance Roberts regularly outlines the various paths the broad market (as represented by the S&P 500) may pursue. In other words, in additional to fundamental analysis, technical study allows us a picture of recent market trends. It’s not an exercise in forecasting we undertake, it’s one of awareness. Here’s a method to develop your Gut Box muscle against taking market forecasts too seriously. Calculate the return required to meet personal financial life benchmarks. It’s close to impossible to get investors to minimize comparisons of portfolio performance to a market index like the S&P 500. Perhaps investors long to boast to friends how their portfolios beat the market (I don’t believe that’s the primary reason). Maybe if an advisor beats a market index, it mollifies buyer’s remorse or justifies fees paid. Perhaps most of all, it’s ignorance. Unfortunately, all of us as financial partners are primarily to blame. It’s not that portfolio performance shouldn’t be questioned. Investors must understand a financial partner’s philosophy, the good and bad decisions (yes, we make plenty of bad calls as so-called experts), fees incurred, investment vehicles employed (watch for expensive market-neutral mutual funds for example); advisors need to do a better job helping clients understand the risks taken to obtain returns, standard deviations or “pendulum swing” in the volatility of a portfolio vs. the market, and most important – the personal returns required to meet financial goals outlined in a comprehensive financial plan. A PRR (personal rate of return) is the consistent return required to meet financial milestones such as college funding and retirement. A PRR is a culmination derived over time from variable assets, fixed, guaranteed investments coupled with a savings rate, lifestyle and human capital or earnings potential, all for a given level of risk. Beating a market index is not going to make you wealthy or help to achieve goals. Investors who attempt to pay “catch-up” or believe taking on additional portfolio risk is the answer are going to be sadly disappointed. For example, if a 7% rate of return is required, the portfolio alone isn’t going to cut it. Holistic changes which include working longer, saving more, increasing earnings, maximizing Social Security, lowering expectations for income in retirement and a dramatic lifestyle downsizing are all options on the table. Increased portfolio risk isn’t the answer. It’s not even close to the answer. So why do many financial professionals fail to help investors focus on realistic returns vs. the storybook returns they want? The financial plan which can help create a PRR, isn’t important. The plan isn’t the focus. The plan is a conduit to sell product therefore it’s reviewed once and gathers dust on a shelf once the sale is closed. There is no plan. The definition of wealth management centers solely on the portfolio and is product driven. It’s too much work to educate existing clients when sales goals need to be met. The sale is complete. Opportunity closed. Now the goal is to keep clients in expensive managed investments for as long as possible. Fees are too high and create tremendous drag on performance. They need the clients. Any clients. The false promise of beating market indexes is a great seducer. Some investor emotional and behavioral pitfalls are just impossible to overcome; advisors believe it easier to throw in the towel (and on occasion it is), let the client move on to the advisor who promises above-average returns. Usually, these clients don’t find plans important and are mesmerized by portfolio performance alone. It’s a tough conversation that professionals are ill-prepared to undertake. Helping clients to examine budgets, earnings potential, methods to downsize, are challenging to professionals who are paid primarily to push products. With a renewed focus on a PRR and how to achieve it, market tops and bottoms become irrelevant. Action steps to meet goals along with realistic returns become a priority. It’s fine to listen to what pundits have to say about highs and lows. Consider it a lesson in financial entertainment. If something is of concern or resonates, then you should be able to discuss in depth with your financial advisor. Or not. Depending on the time he or she has reserved to meet sales goals. Another way to pay attention to the Gut Box but not be a slave to it is to contemplate the tops and bottoms of your emotions. The investors who experienced euphoria early last year and ‘encouraged’ their advisors to take on more portfolio risk were the same ones who couldn’t exit markets fast enough when fear hit the latter part of 2018. To place money into markets or extracting based solely on gut feelings can work on occasion. I’ve witnessed a rare few who have perfectly timed a market exit in 2008. Unfortunately, they have yet to return to stocks thus missing a decade-long, Fed-fueled market return tailwind. Financial media is strewn with the tempting palaver of market experts. It’s tough to separate the nonsense from substance. This is where your Gut Box can be your friend or foe. From an intellectual curiosity perspective, it’s commendable to seek out information from various sources, especially those who conflict with your current opinion. At market extremes, it’s crucial to remain emotionally neutral thus allowing critical thinking and rules to dictate risk reduction or addition.